“I will not slink through the woods, led to my cowardice by common thieves,” Ballack spat. “Then you can die, proud and arrogant prince!” Camille, the young woman, said coldly. Ballack watched as the people he had sworn to protect poured into the woods. “I see cowards following sneak-thieves.” The dwarf prince raised his hammer high, and his soldiers formed ranks. “You truly mean to attack the bridge?” Graeme asked incredulously. Ballack looked and her and stated, “Shut up.” With that, he let out a yell and charged the bridge. The ghost on his left started his drum dirge, while the specter on his right raised the Dundersnuff banner high. 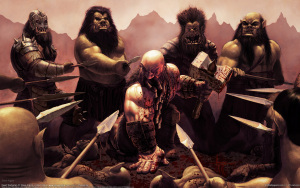 The dwarven phalanx, as well as several therians who wanted the trolls to pay in blood for the attack on their city, plowed toward the troll ranks. “Let’s not waste his sacrifice,” the young Pavee said sadly as he followed the last of the refugees into the woods. Ballack and the others charged the bridge. The dwarves, who were more accustomed to the hard stone of the mountains, were not prepared for the swamp rays. The creatures could create electrical pulses as well as attack with their barbed tails. Being encased in metal armor and standing in water only amplified the damage of the rays. It was the start of a one-sided battle. The first few dwarves were immediately dropped as they stepped on the swamp rays. A werecoyote also stepped on a ray, and felt the wicked barb pierce his calf. Intense pain shot through his leg, but was quickly healed by his therian blood. It hardly mattered, for the trolls poured over the advancing troop in a savage fashion. 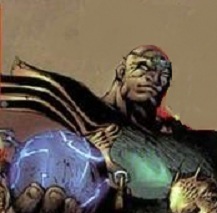 Ballack and his troops were some of the finest fighters in all of Delphia, and many trolls fell to their weapons. However, there were simply too many of them. “Kill as many as you can,” Ballack shouted. “Beat them into the mud,” he screamed as he sent his hammer through the rib cage of a troll enemy. Then he touched a dwarf who was kneeling and healed his friends wounds. “Get back in the fight,” the prince urged. The initial advantage of the trolls had stalled as the dwarves formed their defensive diamond around their prince. It was beautiful to watch the dwarves as they killed troll after troll. Ballack called upon his magical powers and had the corpses writhing and pulling at the legs of their comrades. The few therians that had accompanied the dwarves were already dead. They were tough, but could not hold up against the trolls even with their innate healing attributes. Ballack did not sympathize; they knew the risk. One dwarf fell. Then another. Ballack could not heal them all, he was too busy trying to keep the trolls at bay. Another dwarf down. The diamond was broken. “On your own, then!” Ballack called, and each dwarf broke ranks to gain a more comfortable zone to work alone. They fought valiantly, bringing death to many trolls. One by one the prince’s troops were killed. It was a grueling battle for the trolls, one that took more time and cost more lives than they wanted; but one they would win. Only two dwarves remained; Ballack and one they called “the Hook”. The two were back to back with Ballack using his necrotic magic as a protective orb. “I can keep this up all night, scum!” the warlock promised. At that moment to the south, a huge pillar of fire shot into the night. The trolls had been instructed to return to Shadowmire with any captives upon seeing the pillar of fire. Most of the trolls hustled away from Ballack and his cruel hammer. A few remained, but they never back to the therian city. Ballack and the Hook limped away from the battle at the bridge. The warlock was pleased with the results; more than a hundred trolls were dead in the mud and the others were travelling in the opposite direction of the mass of survivors. He honored the fallen dwarves with a few words, then pressed on toward Oliveloft. “Time,” the word was spoken as though no other word existed. Delia did not seem so majestic now, her superiority was not more. “The answer is time, correct?” This had not been the first time someone had correctly answered on of her riddles, but it was the easiest anyone ever had. The elf had been bandaging a badly torn leg, and hardly seemed to be listening. Yet she had answered it without much thought at all. Delia did not seem pleased. “You have heard it before, Aspen!” It was not a question, but the preoccupied elf took it as one. “No, it was not so hard if you followed a logical thought process.” Aspen did not notice that Delia was scowling at her. She did not realize the sphinx was on the verge of exploding. The cougar that she had befriended noticed, though. Mungo moved into a defensive position between the two. The animal’s movements set off alarms in the young elf. Only then did she notice how angry Delia had become. Aspen knew that ,even without her recent wounds, she could not hope to defeat Delia in battle. She had almost been killed by an owlbear and, if not for Mungo, certainly would have been. Delia, seeing the young and helpless elf’s eyes go wide, softened. “Others found it hard enough. You are not like the others, though. I sense that you are wise beyond your appearance. You answered my riddle, and I confess that I do not like being bested. You will sharpen my intellect and I will attempt to sharpen your own.” Delia felt bad for thinking of killing this girl. Aspen sensed the change in the sphinx’s mood, but she kept her hands close to her blades, nonetheless. Mungo remained between them. “You are a worthy opponent, for riddles, I mean.” Aspen caught the confident Delia’s remark, but could not honestly argue it. Of course Delia could kill her and Mungo both with no trouble. So, the intelligent female played the mind games with the sphinx. “Luck was all, I simply said it was easy because I was so lucky. Nothing makes a problem seem easier than good ole luck.” Aspen felt silly playing on the ego of the sphinx. It brought to her mind an image of a mother praising her child for the most mundane tasks. When the mother asked the child to do something else, the child would jump to do it, without question. This was no child, though, and she knew she had to be careful with the sphinx and her wounded pride. Delia understood exactly what Aspen was doing, but she took no offense. Actually, it did make her feel good, not the words, but the fact that the elf cared enough to try to make her feel better. “You bested me in my own game. Now I must pay up. What can I do for you, young Aspen?” The sphinx bowed her head in a sign of peace. Delia seemed all too pleased by the last response, and nodded. “So be it, and I look forward to meeting you again.” With that, the sphinx was off on the hunt. Not long before sunset, a deer was dropped on the ground right outside of the camp of Mungo and Aspen. Delia paid her debts, no one could argue that.